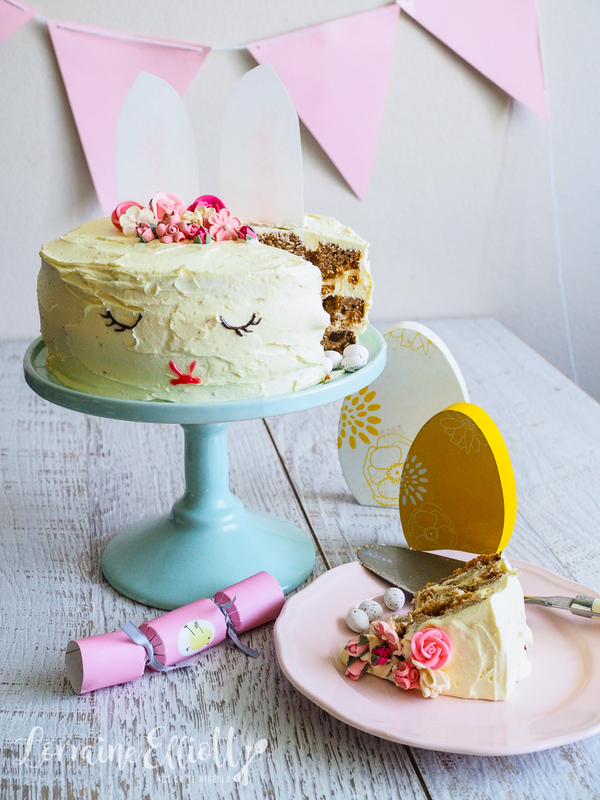 A Sleeping Bunny Rabbit Surprise Cake For Easter! Hop to it Dear Reader! Easter is almost upon us (as is that heavenly four day weekend). My two favourite foods at Easter are hot cross buns and chocolate. 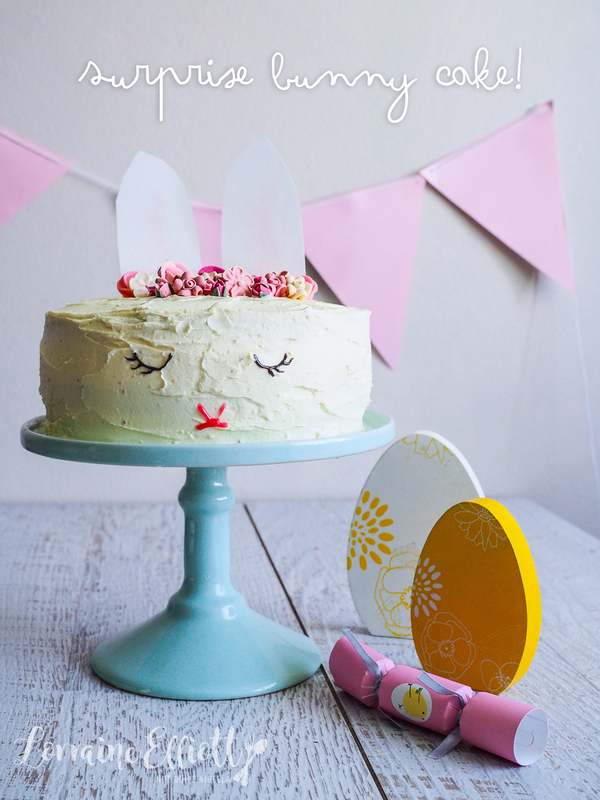 And today's sleeping bunny rabbit cake gives us both in a cake form. 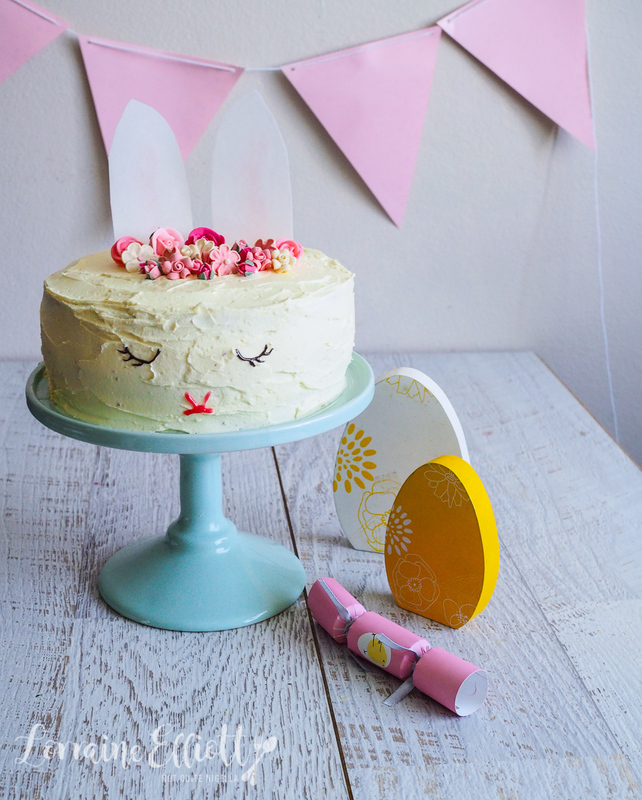 Meet Tilly, the sleeping bunny rabbit surprise cake For Easter! 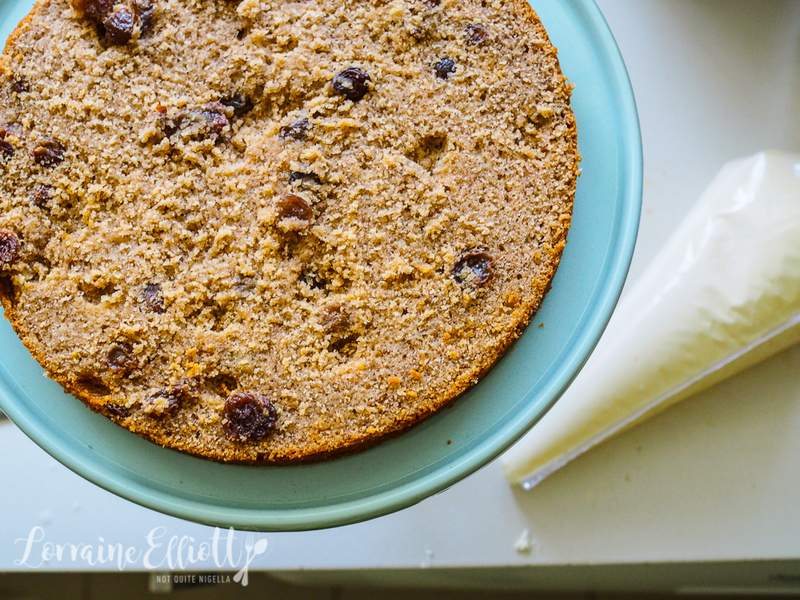 This cake starts off with simple, one bowl mix cake flavoured with spices and studded with sultanas. Then it is filled with some surprise candy eggs for a little chocolatey bonus with every slice! 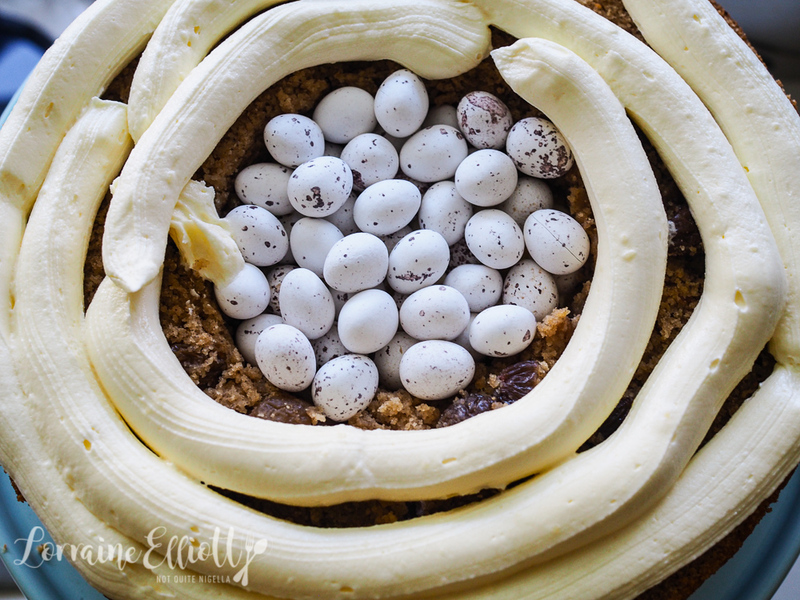 And because hot cross buns are best with butter, a vanilla buttercream gives the perfect backdrop to create your custom faced sleeping bunny! If you've ever wanted to do one of those sleeping animal cakes, this is one of the simplest to do. There's no tricky ganache smoothing or fondant covering. 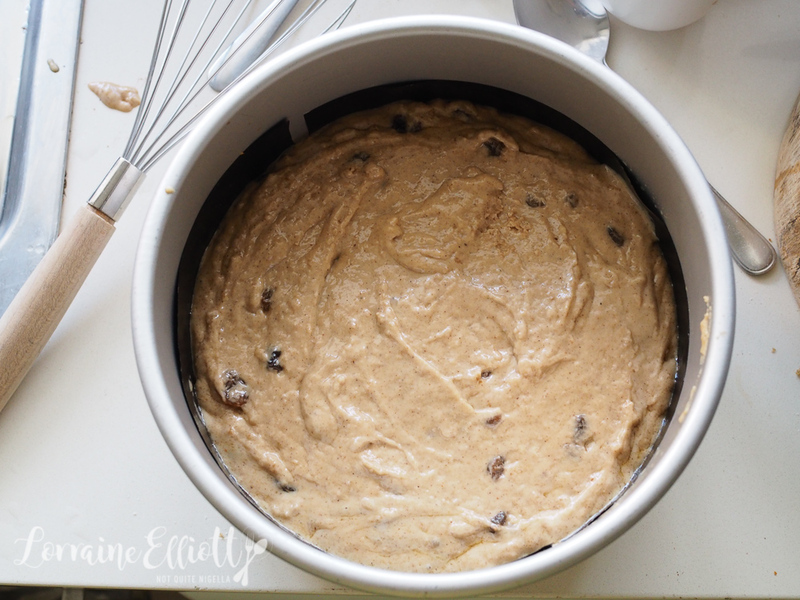 Here the covering is an easy buttercream and the cake itself is really all done in a bowl with a whisk and spatula. It's also a great cake for a crowd as it feeds about a dozen people. And my favourite bit of course is the surprise inside with little speckled Easter eggs with every piece! Because nothing thrills like a surprise (of the good kind, that is). I was recently in for a bit of a surprise this past weekend when I did an escape room with Mr NQN, Nina, Garth and Viggo. We love these puzzle rooms where you have to solve riddles to "escape" (although legally, nobody is really locked anywhere). We decided to try a brand new place in Newtown where there was actually a person in the room with us. Before we started, each of us were assigned identities - each escape room revolves around an imaginary plot and this one was about Nazis and our characters were supposed to be working for The Resistance. Although everyone got regular names I was amused and surprised to see that I was assigned someone called "Grete Foch". I mean really lol! We had some challenges - the guys, mainly Mr NQN and Garth went off and did their own thing and didn't communicate anything to us which is the kiss of death in an escape room. Nina and I felt useless for most of the time as they didn't talk to us. Then they handed us a slip of paper with a proud look on their faces. Garth had written down some clues but Nina and I just looked at piece of paper and then each other. "What language is this?" I asked. It looked just like Cyrillic mixed with Sanskrit (he has harder to decipher handwriting than mine). We were, in one word: hopeless. All the confidence we usually have with escape rooms and getting out in time was quashed. It was like there was a carbon monoxide leak in the room and we were just slow at everything. Instead of getting out in an hour it took us 1.5 hours. We left dejected and in a terrible mood. Later I had to turn to foot long fries to buoy my mood. Forget shopping, eating is the thing that will always make me happy. And a slice of this cake would have done very nicely too! So tell me Dear Reader, are you an escape room fan? 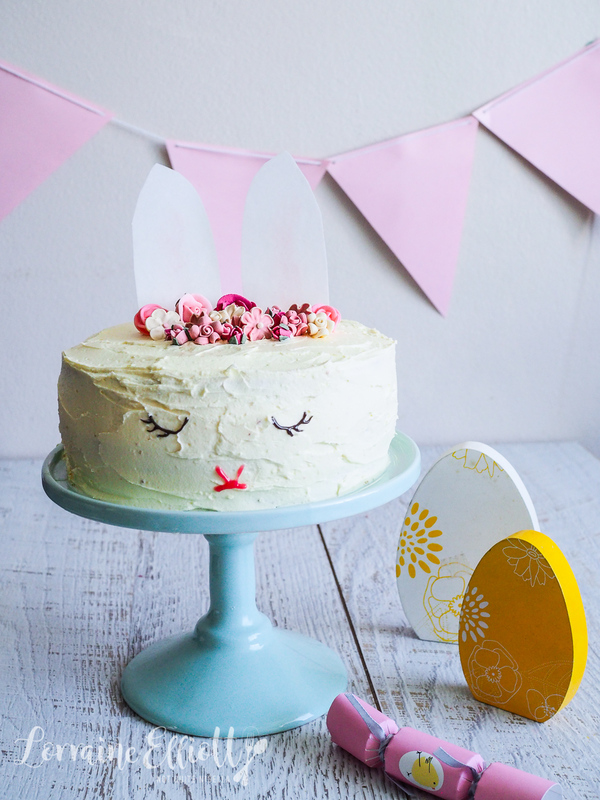 What are your favourite Easter foods? And what puts you in a good mood? If it is food, what sort of food makes you happy? 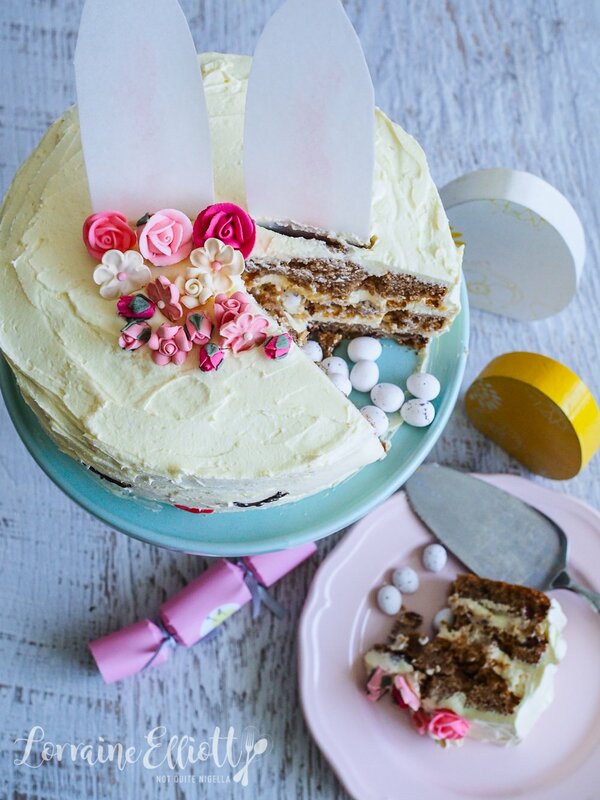 To make 1 cup of cake flour, replace 2 tablespoons flour with 2 tablespoons of cornflour or fine cornstarch. Step 1 - Line a 20cm/8inch round pan on the base and sides. Preheat oven to 160C/320F. Whisk the cake flour, sugar, baking powder, cinnamon, mixed spice, nutmeg and salt together until well combined. Step 2 - In a jug measure the butter, buttermilk and vanilla and pour in and mix with the drained sultanas and flour (do not overmix). Pour into the prepared tin and bake for 60 minutes or until a skewer inserted in the centre comes out clean. Step 3 - Once cooled, cut the cake into three layers horizontally. Beat the butter until smooth in a mixer and then on low speed add the icing sugar, milk and vanilla and beat until combined, then increase to high and beat for 7-8 minutes until white. Step 4 - Fill a large piping bag with some frosting. Place the first layer on a serving plate and pipe some buttercream on top and smooth with a spatula. 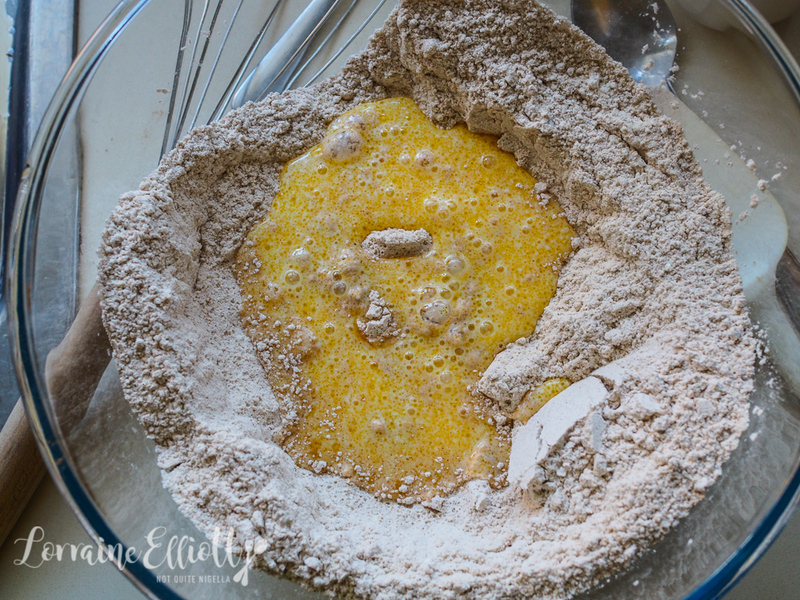 Repeat with the second layer but cut out a circle with a large circular cutter and remove the centre of the second layer of the cake. Fill with the speckled Easter eggs. Pipe icing on top of this add add last top layer. 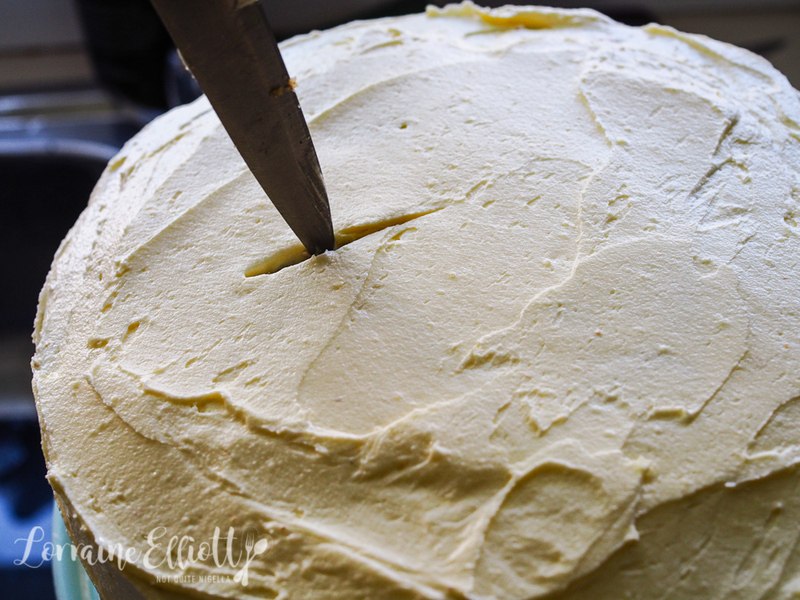 Step 5 - Spread buttercream around the sides and top of the cake until the cake is no longer visible. Draw on the eyes and nose. Cut out ears in the rice paper and brush the pink dust in the centre. Cut some slices on top of the cake and slide the rice paper ears in. Position edible flowers on top. recipeSummoning The Spirits With A Ouija Board Cake! recipe Summoning The Spirits With A Ouija Board Cake!